A new year brings Mayor Fretti's State of the City address for Valdosta. It was quite interesting as an exercise in transparency: he walked through what seemed like every city department, one by one, in addition to talking about overarching cost-saving measures and emphasizing that Valdosta has no debt, not even bond debt. This was all good. I noticed that, unlike last year, there were no military personnel pointed out or even present. I guess the mayor noted that saber-rattling is not in fashion this year. He did mention some details of recent economic improvements at Moody AFB; everyone knows the importance of Moody to the local economy. I did think it was a little over the top when the mayor included in his welcome of new and old county officials that "all roads lead to Valdosta, the county seat." 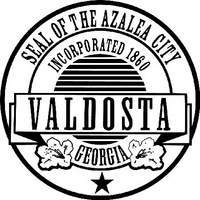 Valdosta Aeterna! Well, Valdosta, unlike Rome, may not be eternal, but bickering between the city and the county apparently is. Also, as I mentioned to the mayor afterwards, I had hoped he would say a few words about the proposed bus system. He indicated that he had simply forgotten to do so. That's understandable, considering all he did talk about. Next year. If you live in Valdosta, I understand you can view the mayor's speech on local cable for some time to come. I recommend it. The full text is on the Valdosta city web site (yay! ), even though it's in a hidden link (which I've dug out and linked in here) and in Microsoft Word (boo!) instead of as plain HTML. In the regular agenda, the elephant not in the room became even more obvious by its absence. At the citizens wishing to be heard section, nobody came forward. For that matter, there were almost no citizens present other than elected officials, city employees, contractors, and press. This is a problem. The city of Valdosta is going to some lengths to be transparent and to accept citizen input. Where are the citizens? Also, this being Valdosta, the one item on the agenda that got the most discussion time was the tennis court improvements at McKey Park. Sports rule in TitleTown! Perhaps the new county commission chair will think about giving a State of the County talk.